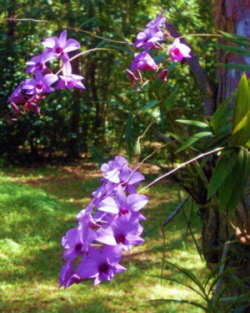 The Cooktown Orchid is the Floral Emblem of Queensland. Dendrobium is a large genus (category) of more than 1400 species in the southwest Pacific and in eastern and southern Asia. Dendrobium belongs to the Orchid family, which is the largest family of flowering plants and is widely distributed throughout the world. The Orchid is found in northern Queensland, from Johnston River to Iron Range. It used to grow abundantly around Cooktown but is now quite rare. These plants can grow up to 80 cm in height and can have from 3 to 20 flowering canes. The stems that bear the flowers are 10 to 40 cm long and can carry up to 20 flowers. The flowers are about 3 to 6 cm wide and are normally deep to pale lilac in colour. Flowering time for this Orchid is normally between March and July, in the dry season. Named in reference to the northern Queensland town of Cooktown which is situated in the natural range of the Orchid. Confirmed as the most popular choice for the Floral Emblem in a public poll when Queensland was preparing for its Centenary in 1959. The Cooktown Orchid was officially proclaimed the Queensland Floral Emblem on the 19th of November 1959. They may be propagated from seed by commercial Orchid laboratories.